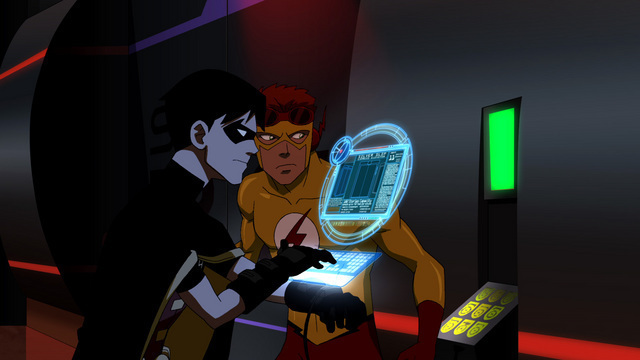 robin and kid flash. robin is hacking while kid flash watches. Wallpaper and background images in the Young Justice club tagged: justice young. This Young Justice photo might contain straße, stadtszene, städtische einstellung, stadt szene, städtische umgebung, szene mit straße, stadt, and städtischen einstellung. I know right and all my firends are like Kid Flash is not adorable he`s ugly. And im like WHATS WRONG WITH YOU! ^ OMG THAT IS WRONG! I know right! My firends r stupid 4 sayong that!& R jerks! I ment 2 say SAYING not SAYONG. I must of bin tired when i typed that. OMG gesse what! my friend made a fan pop & got all into young Justice! Yha! She saw the first episode and was like it was made from god! I was like ok but i was tun with joy! And she has a fan pop 2! With a cool icon! From a dress up game!